What did the 2006 military coup show us? It demonstrated that the crux of the Thai crisis is far more serious and much wider in scope than had previously been thought. The monarchy is surely not a victim in the protracted conflict, but the root cause and continuing factor that has eroded Thai politics. The coup set in motion more prejudicial uses of the lese-majeste law, and in the process, has le… d to more political prisoners. It has also shredded the military into several segments, turning generals into desperate royalists who continue to live off the monarchy in order to survive. Issues of violence in the Thai south and the Thai-Cambodian dispute became greatly intensified in the age of militarized politics. The coup also produced unique colour-coded politics and created crises of legitimacy. 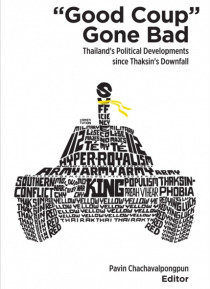 This book is a collection of essays that reflect developments in Thai politics in the post-coup period.